This review has not yet been approved by the owner of this writing service. 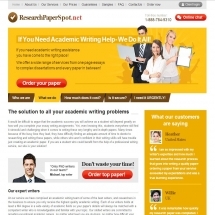 If you are the webmaster of Researchpaperspot.net, please Contact Us to approve or remove this review. The site design is poor, as well as its usability. The order form looks as if it is broken, the amount of filler text is excessive, useful information is almost absent… But all in all, it isn’t much worse than the majority of writing services out there. Pricing policy used by this service is completely incomprehensible. It seems that they have been trying to implement one system, decided to change it to another when they were already halfway through but forgot to exclude the elements of the first one that have already been included. As a result in their order form the academic level and the degree of quality of the assignment are listed in the same box: High School, College, Bachelor, Graduate, Master, PhD, Standard Level, Advanced Level, Premium Level. Prices are all mixed up – there is no logic in interconnection of these factors. All in all, the prices range from $19.95 to $45.95 per page – certainly not low, but not as high as in many other writing services. Support is available via chat, phone, e-mail and a query form. The operators get back to you almost immediately, but are very slow to actually give any answers. The service offers a number of examples, and they are written reasonably well. There seem to be a little too much quoting, which may lead to a conclusion that these article have been simply rewritten, but the quality as it is leaves a pretty good impression. You can contact your writer directly via the Message Board. General impression left by ResearchPaperSpot is a rather poor one. After all, if the company in question is incapable of keeping its ordering system, the most conspicuous part of the service, in a working order, what good one can expect of it? The prices are a little bit higher than average, but with the state of the site one can easily find other, more trustworthy-looking places offering their assistance for the same fees.